It's here, my book! 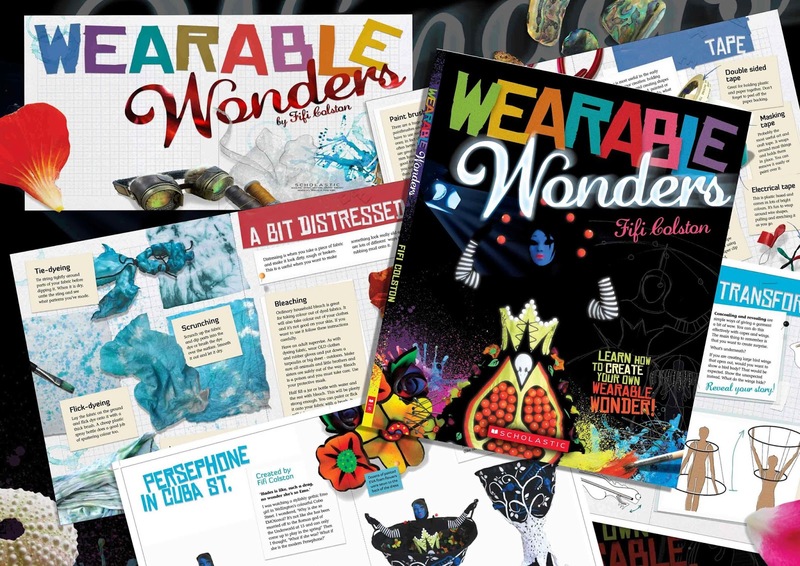 I have spent 5 months over spring and summer on it and it is chock full of tips, tricks and ways to go about coming up with ideas, materials and construction of a Wearable Art piece. This is no 'How to make a dragon costume and here is the pattern' book. This is about how to find ideas and resources, inspiration and team. 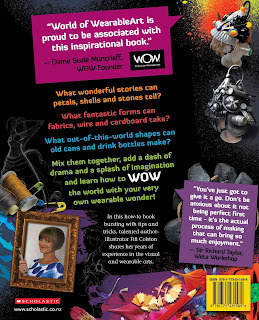 It's for the young designer- aged 10-14 and their teachers, parents and caregivers. If you don't see The Red Poppy in a bookstore near you, you can order it online here or here. I've been down in my cups lately; a combination of factors in our household. I can most often get through all the hurdles by doing the thing that keeps me sane. Writing, drawing and making things. Happy and bouncy with a million things on the go and juggling them all with heart racing and eyes gleaming at the challenge, my days are always too short. I fear that I will die before I get to finish all the things I want to do in life; and the women in my family live a long time- so my demise isn't imminent. But right now I can't get motivated at all and I sit staring out the window feeling blue. 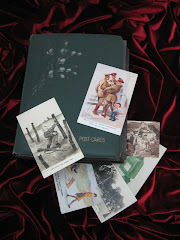 Surrounded by writery and illustratory friends last night over a pot luck dinner (after Melinda Syzmanik's book launch of 'A Winter's Day in 1939' which you MUST buy for your kids and then read it yourself) I realised why I have felt so deflated and unable to build enthusiasm for my next project. Creating a book is a very visceral thing. You pull out everything from your heart and soul and pour it in; there is hard work, self doubt, more hard work and more self doubt. You get it done and send it off and wonder if this baby will grow to be a good and useful member of society or be the victim of cot death before it has a chance to focus and smile. Writer friends understand this. They know that being a creative is not necessarily a happy, rose filled vocation. We are driven; and sometimes that sends us a little bananas. Luckily we all sit in same fruit bowl. The latest book which is now off to print took me 5 months all through spring and summer. A shortish gestation really but is the culmination of years of my art practice. It's the sharing of 80% of everything I know to date- the other 20% is too advanced for the age level of the intended readers. But it took 100% of my effort; gathering resource, writing, illustrating, creating, photography, digital work and revisions. My head feels empty now- like I've transferred the contents of my hard drive to a cloud and lost the password. I'm worn out after the labour and still in a tired haze. I did too much too soon after giving birth and possibly have a little post natal depression. I'm going to cut myself a little slack and scale back on getting back to work in a hurry. 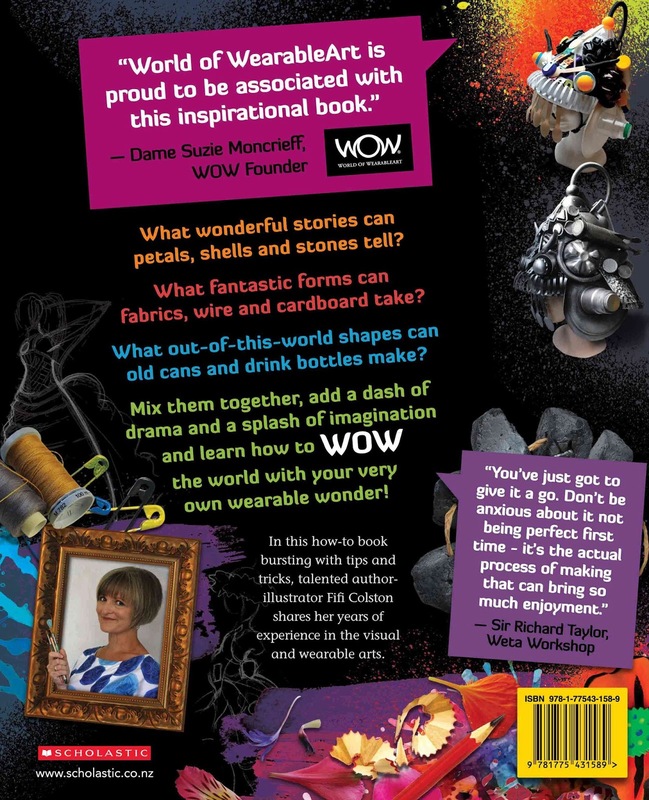 The book is due in July by which time I'll be full of motherly love for it and proudly show it off everywhere. I've named it already; 'Wearable Wonders.' I hope it's a good baby. The illustration is from a poem I wrote for Next magazine when I had my regular column there some years ago. It's called Cry Baby. Have you got a moment free? Please spare some time for me). And I'm about to lose the plot). I was wondering, is it ears? And I'm constantly in tears). To help him settle more? Or is that against the law?). I'll go screaming round the town). 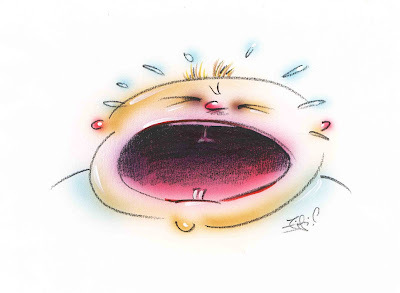 I have a friend who says 'Things will be different next Tuesday'. It's her maxim for life and I remember it when things are tough on Thursday. Last week was my weekus horribilis creatively; New Zealand Post Children's Book Award shortlistings do your head in, no matter how resilient you think you are. 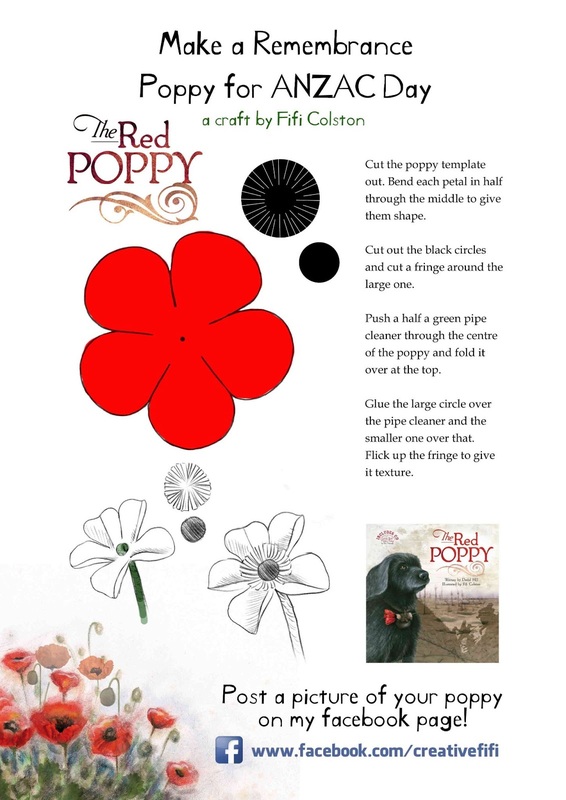 So I'm very pleased to say that on Saturday, The Red Poppy made the Storylines Notable Book list; we have not been forgotten. I didn't really think about how great that was until today, because Sunday was spent in a state of anxiety with our son's impending surgery. He is 22 and needed a rib removed- not for any aesthetic reason as Marilyn Manson was rumoured to have done, but because he had an interesting condition called Paget- Schroetter disease or Thoracic Outlet Syndrome that caused some worrying blood clots last year. There is always a risk with surgery, but I'm happy to say that he had it yesterday and has come through it beautifully. Tuesday has arrived and here we are, looking forward to next week. Whilst waiting for him to come out of the operating theatre I finished the book I was reading. 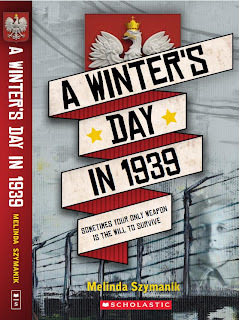 Melinda Syzmanik's 'A Winter's Day in 1939' (Scholastic). It is a superb and haunting tale based on her father's own history. It's the story of Adam, a 12 year old Polish boy whose family are transported to work in Soviet labour camps during WW2. There is a particular scene in the book that stayed with me. It was a metaphor for me for the way I was feeling on Monday; small and helpless whilst danger sniffed all around; praying that death would leave and hope would be restored. 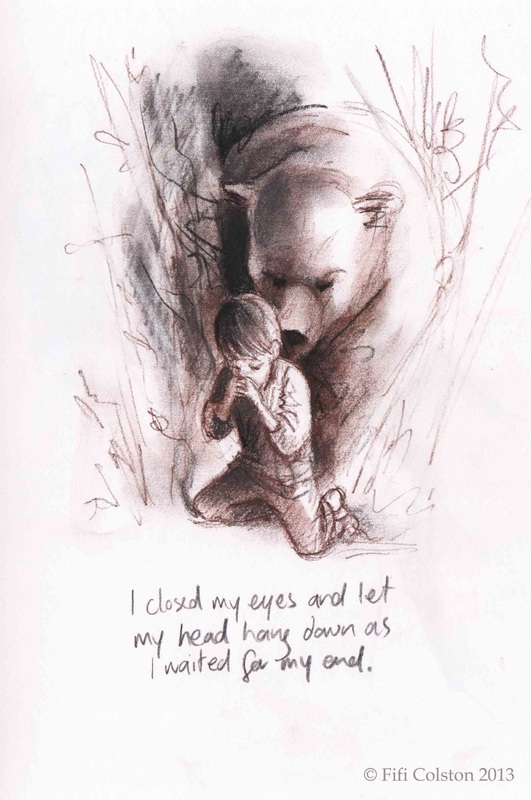 I find drawing a calming thing in times of stress, and drew what was there in my head from Melinda's words. The pencil was in my hand before I had a chance to refuse it. I can draw anywhere and a hospital waiting room is no exception. I'm not often compelled to draw scenes from a novel, but the images she evokes are so vivid I couldn't help myself. 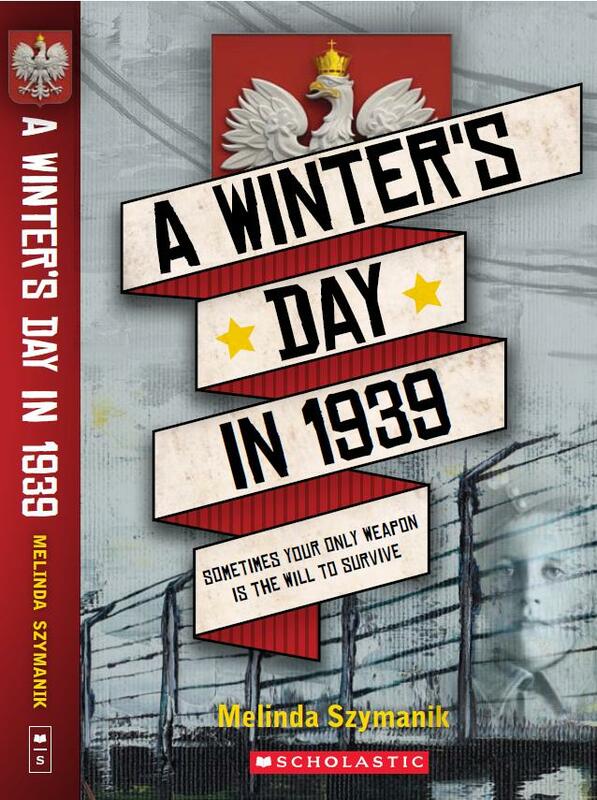 A Winter's Day in 1939 is being launched in Wellington on Saturday at The Children's Bookshop in Kilbirnie at 3pm. I don't think anyone will mind if you pop along and buy a copy. Least of all you. 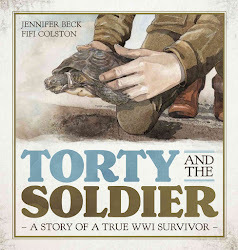 Disappointed about not being on the short list for the New Zealand Post Children's Book Awards? Of course I am. I would be a filthy liar if I said otherwise. I poured my heart and soul into the illustrations for David Hill's The Red Poppy. I started the project by declaring to myself that if this was the last book I did for any reason (death or disenchantment) that it would be one I'd be super proud of- that I could RIP on it. 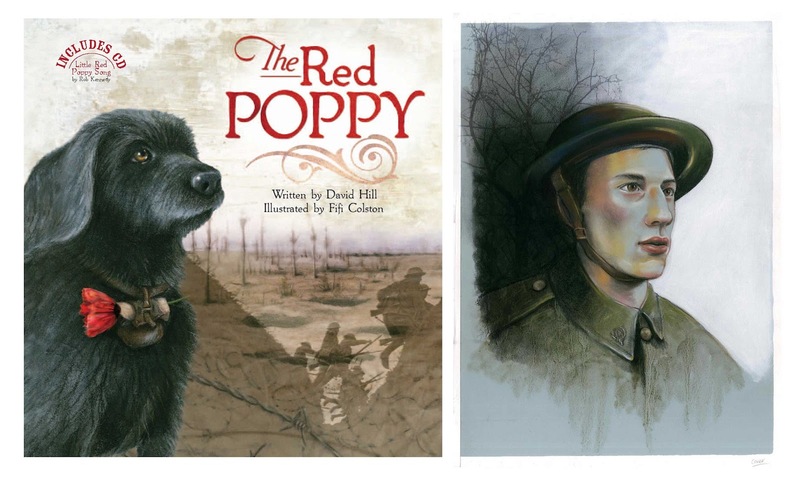 But it seems that this year trenches are not in vogue for picture books- although I am absolutely stoked that ' My Brother's War' a novel by David DID make the list- it's a superb read and at this point I extend my heartfelt (yes really) congrats to the shortlisted ones. It's a fantastic day for you and I HAVE been a judge before so I know the angsting that goes into the process and the certain knowledge that you will break the hearts of anyone who didn't make the cut. There are some really great books there and the judges have made really thoughtful choices. I also knew some weeks ago that I hadn't made the list (having been a judge I know how the notification goes) so it isn't a surprise to me today. So back to me and my obsession to be on the list- why? Well, the carrot on the award stick is sales. You get shortlisted, the book gets more publicity, people buy it, you get to fill the car with petrol/buy groceries for another day (you don't get to buy a Porsche because our sales figures in NZ are small because the population is small). It also makes you feel immensely validated for your hard work I'm told (I have not been shortlisted for the Post Awards to date). You get metaphorically showered with petals on a sparkly podium. It's on the bucket list of people in this game. I guess I'll have to live another year- that's gotta be a good thing right? It's all put in to perspective for me by the blog of the lovely daughter of a friend of mine who doesn't get to live another year. She has cancer and has 6 months to live. She is 19. Harriet is the bravest person I know and one of the most talented writers. She has a bucket list too. In 3 weeks she is going overseas with her family to visit the Anne Frank House in Amsterdam, to see the place of another girl who didn't make it her 20's but none the less left a remarkable impact on the world. I'm painting her portrait this weekend. I'm hoping it will be the best illustration I ever do. It doesn't need any award. I'm honoured enough.